Last week we got bored with the usual random combination of chicken and whatever else was in the pantry. We decided the throw some mushrooms into the mix (after finding these cuties at Trader Joe's). We combined chicken, mushrooms, onions, cheese, and breadcrumbs. Let's be honest, what else do you really need in a meal? Our little stuffed mushroom concoction came out so wonderfully that I felt like I had to share it. In my mind, I've pretty much convinced myself that organic cheese is healthy. I mean it is gluten free and sugar free. I'm a sucker for good, brown, sweet, sautéed onions. I cook them until they are as browned as possible (which usually takes about 20 minutes on low heat). You should start this process first, and prepare everything else while the onions are cooking. Just don't forget to continuously stir the onions every few minutes. While the onions are sautéing, start preparing the chicken. We only used one breast and seasoned it using this Williams Sonoma seasoning. 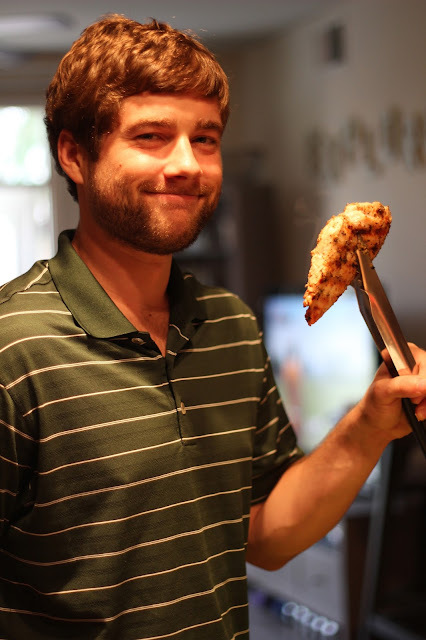 Josh grilled the chicken until it was no longer pink in the middle, then chopped it up into itty bitty pieces for me.
. . . and our new infrared grill isn't too bad either. Next up, prepare the shroomies. I removed the stems (to allow maximum stuff space) and then chopped the stems so they could be incorporated into the stuffing. No mushroom part left behind. 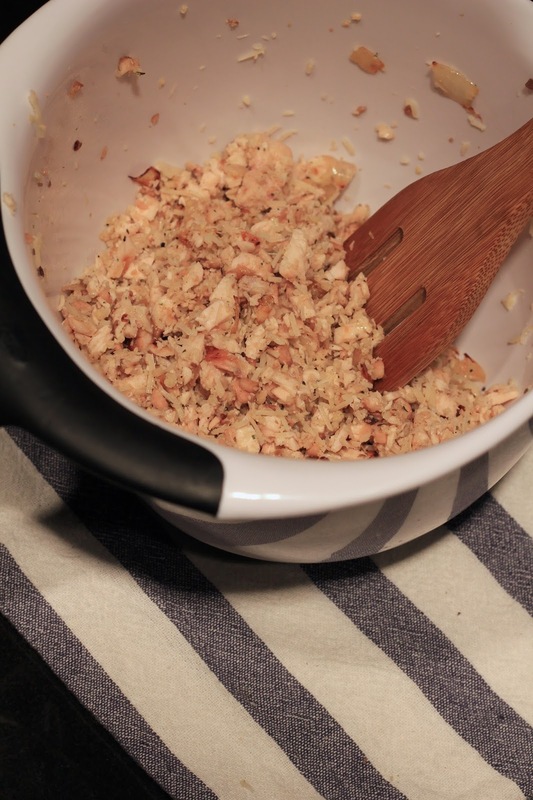 Dump everything into a bowl (cheese, bread crumbs, chicken, onions, olive oil) and stir stir stir. Arrange your mushrooms ever so neatly into a baking dish. I found that a pie pan worked the best, so that the extra stuffing could fill in the gaps without being spread too thin. Stuff each mushrooms as best as you can, then just start filling in the spaces of the pan with the rest of the mixture. We sprinkled some extra parm and breadcrumbs on top (to give us that crunch factor) and then baked at 350 degrees for about 20 minutes. The final result did appear rather brown, so maybe next time we should throw some kale into the mix. I once heard that your meals are healthier if there is a wide variety of color involved, but I think it's a lie, right? Please let it be a lie. Mmmmmmm! And that whole color in your food thing... Let's just say my family is kind of a monochrome bunch. Yum, I absolutely love mushrooms!